Last friday, at the National Museum of the USAF, the Apollo 11 astronauts participated in a panel discussion about their historic Moon landing. They spent a good portion of the discussion, however, not on the Moon — but Mars. 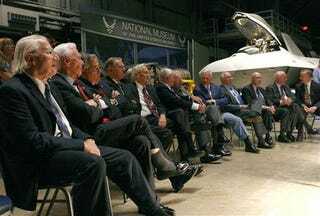 The discussion took place during the National Aviation Hall of Fame Spirit of Flight Award. Neil Armstrong talked generally about the benefits of setting large future goals, but Buzz Aldrin specifically said that humans should aim next to land on Mars. It's interesting that NASA hasn't had a clearly defined goal like the Moon landing since that goal came to fruition. The Moon landing forced NASA to quickly develop highly experimental technologies. A similar push to Mars, at least according to Neil Armstrong, would spur additional new technologies and jump-start the future. So no matter what NASA actually intends to do, it's clear that the men who actually journeyed to the Moon are tired of all this Moon talk. They are taking their official Mars pitch to the president today.